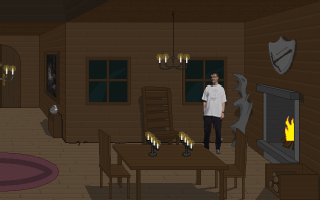 After your crash you’re in a spooky house. One phonecall and you’re on your way home. To the right is a phone on a little table. Pick up the phone and … no dialtone. The cable must be broken. Against the wall is indeed a broken cable. To the right is the plug. Better take it out first before we get electrocuted. Take out the plug and repair the cable. Then put in the plug again and use the phone. You want to call your sister, but she doesn’t answer. Then just a cab. But you don’t know any numbers of cabs. Under the phone in the table is a drawer. Open the drawer and take the PHONEBOOK out. Call again. That’s the cab company. Where they can pick you up? Good question. Put down the phone and walk into the room. On the left is a ghost. Talk to the ghost. This is a sensitive ghost. You have to ask the right questions, otherwise the ghost won’t answer. Asking the address right away doesn’t work. So, introduce yourself. Ask the ghost if he’s allright. Ask him why he’s so sad. Comfort him saying it must have been an awfull nightmare. Then ask the ghost how he died. When the ghost is satisfied and thanks you for listening, you can ask the address again. Walk back to the phone and call a cab. Now the cab’s on it’s way, walk to the front door and try to open it. It’s locked! There must be another way out. Look at the windows. They all seem to be closed as well. Go back to the ghost and ask for help. But the ghost can’t go out so isn’t of any use. Walk to the middle of the room. Then look up (right click). The big chandelier goes way up into the tower. Use the chandelier to climb up. Oh well, so much for the chandelier. Take the ROPE from the chandelier. Walk to the right to the fireplace. Above the fireplace is a shield with a bow and arrow. Try to take it. Just too far. Take a LOG from the crate and use it to get the BOW and ARROW from the mantlepiece. Walk back to the middle of the room. Use the rope on the arrow and use them both on the bow. Now use all together upwards and shoot the rope into the tower. Climb the rope to open the round window above you. Try to open the window (right click) but it’s stuck of moisture. You should be able to dry it. Climb down the rope and go back to the fireplace. Use the log on the fireplace to set it on fire and take it back to the middle of the room. Climb the rope again and use the burning log to dry the window. Once that’s finished, you can open the window. Select the window again to go outside. Now that you’re on the roof, you wonder how to get down. Oh well, let’s worry about that some other time. In the game “Alone in the Night” where you light the log in the fireplace, it won’t let you light it. So I can’t finish the game and I would really like to finish it. Please disregard the post I sent on the game “Alone in the Night”. I finally finished the game. It was fun too. Do you have any more like this. Maybe some a little scarier. I love scary games, and ones with lots of puzzle solving; clues and such. Was a bug where my character got stuck inside the rocking chair. OTher than that great game.